We’re getting creative with food lately in the Grandy household, as I don’t want to be dragging the kids to the grocery store every day (I mean it is summer, come on). So, I find myself scrounging the pantry and fridge for some new and tasty lunch and dinner ideas. Zoe has been super helpful at creating some fun pantry lunches. She made a cheese quesadilla with salami in it last week, and she’s been awesome at packing leftovers for lunch to take to her intense dance camp. Eli just happily eats whatever combination Zoe and I throw at him. He’s not a picky eater at all. I took a look in my fridge, and I of course had some kale, (remember, I am kale obsessed) and some leftover ricotta from this amazing grilled kale and ricotta salad I made last week (recipe later). I had a big bowl filled with nectarines, pluots, (a plum-apricot hybrid) and plums. 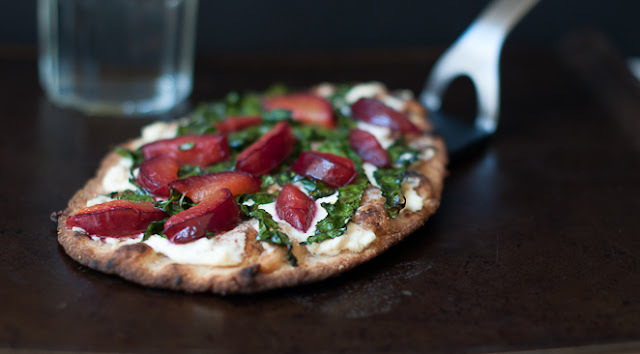 I always keep some whole-wheat naan bread on hand to make mini pizzas with or to serve alongside a kale salad for dinner. I thought to myself, why not create a mini lunchtime pizza with the above ingredients. Don’t you love it when you get creative, and end up coming up with something so delicious? Sometimes those are the recipes that turn out the best because there is a sense of pride in the effortless creation. This is an aesthetically beautiful pizza. 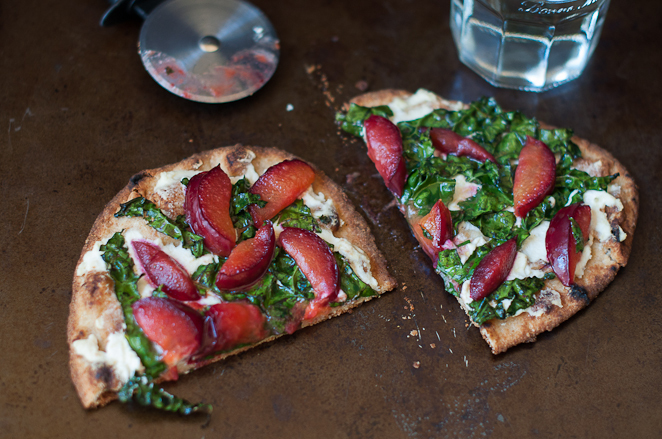 The crispy green kale contrasts so beautifully with the pinkish red pluots. The heat slightly wilts and chars the kale and really brings out the green color. 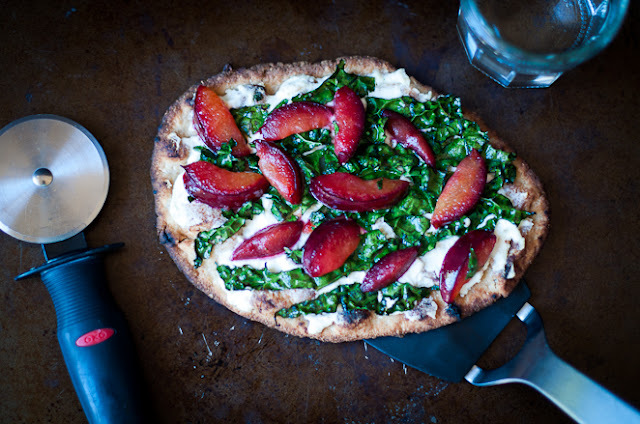 I think this pizza would be a beautiful appetizer as well. Preheat your oven to 425 degrees. Spread a layer of ricotta onto the nann bread. 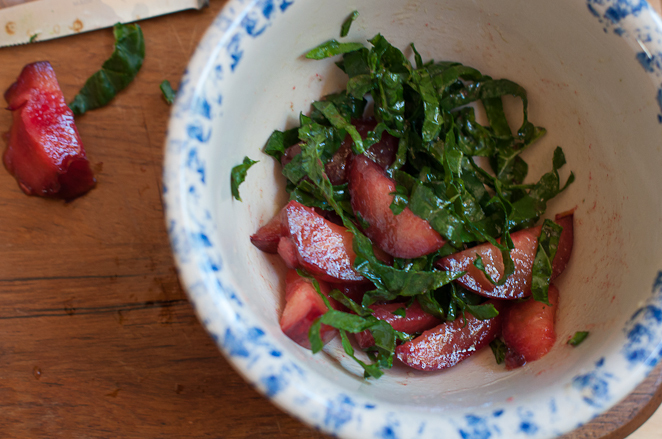 In a small bowl, toss the sliced kale and pluots with the teaspoon of olive oil. Top the pizza with the marinated kale and pluots. Bake at 425 for about 7-10 minutes, or until the crust is browned. Slice up and enjoy. I paired this pizza with my lacinato kale salad, and it was the perfect healthy lunch. You could also throw this combination on top of a regular pizza crust to make a larger dinner sized portion, just make sure to increase the quantities of the other ingredients. 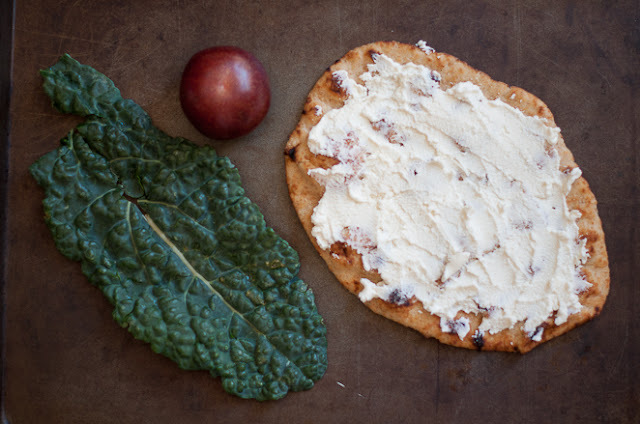 If you don’t have ricotta on hand, you can try another soft cheese such as goat cheese. 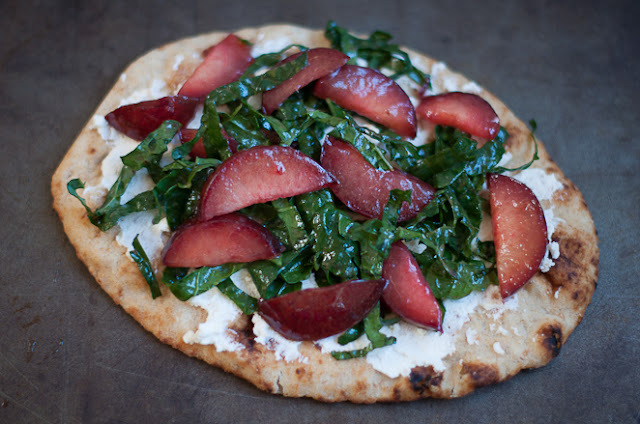 I think I am going to pick up some pizza crust, and make this for dinner next week for John and I. Come to think of it, my kids might even like the sweet combination of the pluot and the tartness of the kale. I will give it a shot and let you know their opinion! So, this was my first attempt at taking photos at home with the Aperture setting. I had a lot of photos that I discarded and though I didn’t necessarily get the perfect photo (one without any blurring, the crust is blurred in some spots), I feel proud that I keep the camera in manual mode and didn’t give up and go to an automatic setting. My next step is to figure out how not to get a blur in my photo. Maybe I need to work on the focus, or turn up the ISO or drag my tripod out of the garage and start using it. Here is my how I set up the pizza to be photographed. As you can see, I have tons of natural light with the french doors, (almost to much, I think). I used a black foam board for the background as well as on the right side (opposite side of where the light was coming in from). The black helped to create a mood, and to showcase the colors on the pizza. 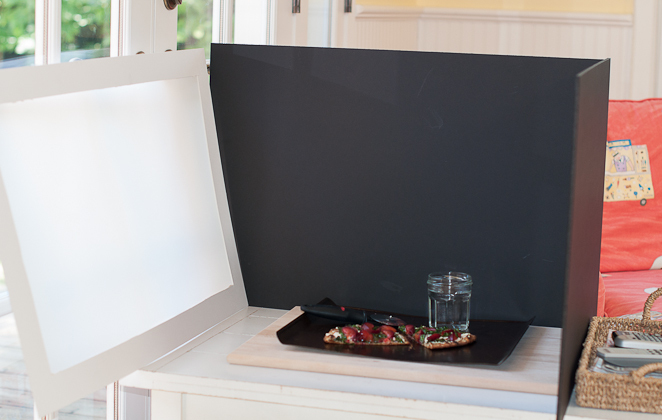 I will explain more about boards and such in part 2 of my food photography workshop. thanks for all the food photo tips! lucky to be taking classes. your photos were already gorgeous! love the simplicity of this recipe. Thanks Kristina. The photo course was so much fun and I did learn so much, but I really need to take the time to practice and its hard to do that in the summer. Thanks for the compliments! Thanks Jessica! It’s a pantry throw together lunch just like your grilled cheese and avocado sandwich. FANTASTIC!! I just love the flavors – so creative and delicious! Beautiful colors on this pizza, Jackie. Not being the kale fan you are, I’d be tempted to make it with ricotta and fruit and basil or mint for the green. I had a delicious soup while I was in France that incorporated melon, cream and bacon, so I also wonder if adding a little prosciutto or Canadian bacon might be good. Mint would be amazing on this as well as prosciutto. You just yummed it up for me. Hi Maria. I will keep sharing the tips to show how I am navigating using the camera in manual mode. Oh heavens – the photos Ive taken since Saturday have been AWFUL – wait til you see! Major blur going on. However Im happy that we now have the basics – I think it really is a matter of working out the best time of day – and I still need to get those boards. Plys I need to download Lightroom, which I was actually just about to do … but then I thought I’d optimistically check your blog! :). Girl! I am right there with you. Keep sticking to it though. I made this soba noodle dish last night and I actually got a good photo. I switched up the ISO and aperture and got a clear photo. I really think I need to set up my tripod, but it’s such a pain. Get the free trial of lightroom and just test it out. 3o days is a long time and it’s really a good amount of time to gage and get use to it. I like the sound of your peach, kale and roasted cherry salad. Yum! Post the recipe girl. I love seeing your camera set up, food photography is a challenge and I love seeing how others manage it. I’m all for creative cooking in the summer, and pluots on pizza definitely falls into that category!